One of my all-time favorite "I'm bored and just want some company" movies is The Truman Show, starring Jim Carrey in a relatively subdued performance. This classic spoof on the rising culture of reality TV remains as entertaining now as it was back in 1998. Its treatment of the subjectivity of reality is shared with the 2013 gem C.O.G. — which makes them a perfect Double Feature pairing. 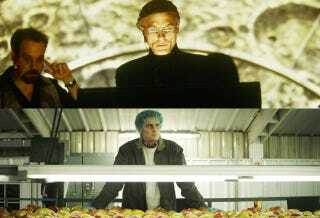 While at first glance C.O.G., a film based on David Sedaris' essay about an Ivy League graduate who travels to Oregon to pick apples, bears little resemblance to The Truman Show, under the surface these two films contain a similar message: "We accept the reality of the world with which we are presented." This is a line of dialogue said by Christof (Ed Harris), the character who created The Truman Show, the show within the film The Truman Show (have I lost you?). He defends the reality show empire he has built and justifies filming an oblivious man 24-hours a day for the entirety of his fake and micromanaged life. As far as Christof is concerned, the phony world created for Truman is his reality — and it's Truman's choice to accept it as such. Like Truman, David/Samuel takes on the roles laid out before him. Whether it's an apple picker, factory worker, craftsman, or born-again Christian, David/Samuel comfortably eases into each new identity — except, perhaps, the most important one: his own. As Truman gets closer and closer to discovering the truth throughout The Truman Show, C.O.G. shows us a young man running farther and farther away from it.